In today’s world of business, we are in constant competition not only with brick and mortar stores, but now with online ecommerce it makes it even more important to be unique. Stand out from the competition and gain independence from the ordinary with these simple yet effective ideas. #1. Provide excellent customer service. I know you have heard that a thousand times, but it really is the most significant contributor to the success of your business. With consumers in today’s market, online is king and a they prefer to shop on their own time within the comfort of their own home. Hence why the world of online sales has skyrocketed! To compete with online retailers, it is imperative that you provide an amazing customer service experience that makes the customer want to come back. The great thing about online shopping is the convenience, but what online cannot provide is the face to face relationship that keeps customers coming back, use this to your advantage. #2. Frequently change your offerings and the way you present your business. Whether it be changing images on your website, changing the graphics and signage you have in store, rotating promotions you offer, or even changing the look of your space with an update to your displays. Giving the customer a new “view” often helps them remember why they keep coming back. A great way to update is by adding a feature unit, something like the Luminato is a great choice. Not only are you adding more space to display merchandise, but it provides a stage for marketing materials and graphics. #3. Make it easy for your customer to shop. Retail businesses many times show too much merchandise and it can be overwhelming. It is important to find the perfect balance between the amount of merchandise that is right for your business and for the customer. Creating a comfortable, well organized, and easily accessible shopping environment for your customer will improve the profitability of your business. There are many great ways to do this, and below are just a few ideas. 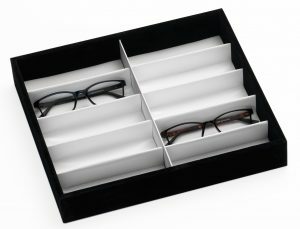 Frame Trays: Trays can serve many purposes in an optical store, the obvious being as storage in a drawer or on a counter. But our favorite use of the Tuxedo Tray is as a “shopping” tray for your customer. Once they have a tray full of frames they can bring it to the optician full of potential sales. Ice Cube Panels: The Ice Cube is a great way to showcase a lot of frames while still being simple and organized. In addition, the open airy design doesn’t collect dust as much as shelves would…so less work for you when it comes to cleaning! Mirrors: Mirrors are a simple addition that is often overlooked. How will your customer see the merchandise and the way it looks on them without mirrors? Exactly…that is why it is so important to provide mirrors whether they are wall mounted, rod mounted, or counter top mirrors. By following these 3 simple steps, you will be making moves in the right direction to stand out and be “independent” from the competition. 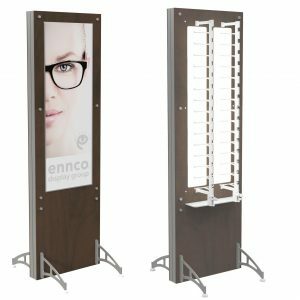 If you are interested in more ways to organize your space or looking for a new display, check out our website www.ennco.com (for the online focused consumer) or give us a call at (425)883-1650 to talk about your space! Author enncogrpPosted on July 27, 2017 Categories UncategorizedLeave a comment on Independence from your competition!